I don’t know about everyone else but I find it incredibly hard to motivate myself on a Saturday morning. It must be something about the potential sleep in and the knowledge that we have another 48 hours until Monday arrives when we all have to go back to work. Despite this prospect, I find it virtually impossible to take advantage of these lazy Saturday mornings. With so much to squeeze into two days the guilt takes over and I force myself out of bed, resisting the lure of the weekend newspaper and get my to do list up and running. Naturally the first thing on my list is exercise –I did try Saturday morning exercise for a while, water aerobics to be exact and I actually enjoyed it but then winter arrived and the thought of pulling on a bathing suit and getting in a pool at 9am was enough to start making excuses; ‘I’m allergic to the chlorine’ and ‘My bather don’t fit anymore’ lasted for a while before I just gave up. Instead, I watch my partner get out of bed at 7am, and as he heads off to boxing I roll over knowing I have at least another hour of uninterrupted sleep. In an attempt to make myself feel like I have done some exercise, I start to clean the house. This is actually something I have no shame in admitting I love doing and find it is the optimal tool of procrastination and a great way to cross number two off the list. 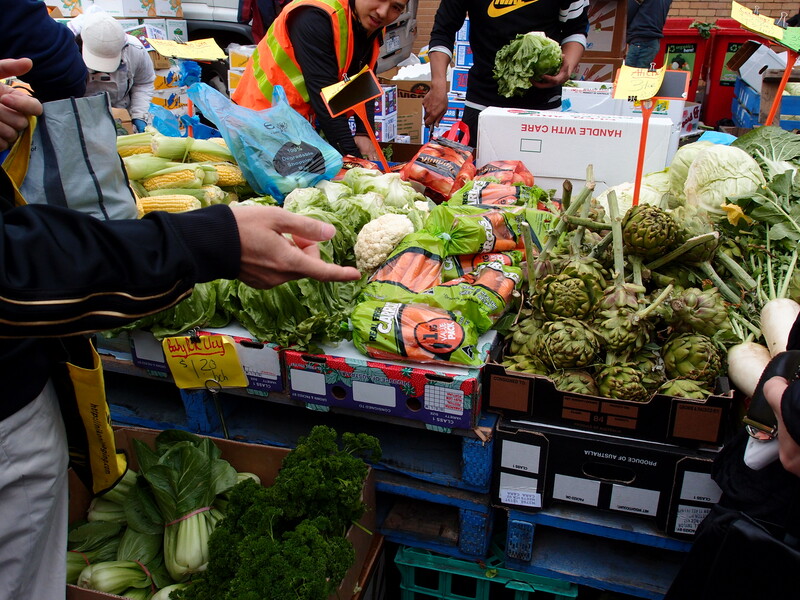 By this point I am starting to feel I need to get out of the house which brings me to number three: The Gleadell Street produce market in Richmond. 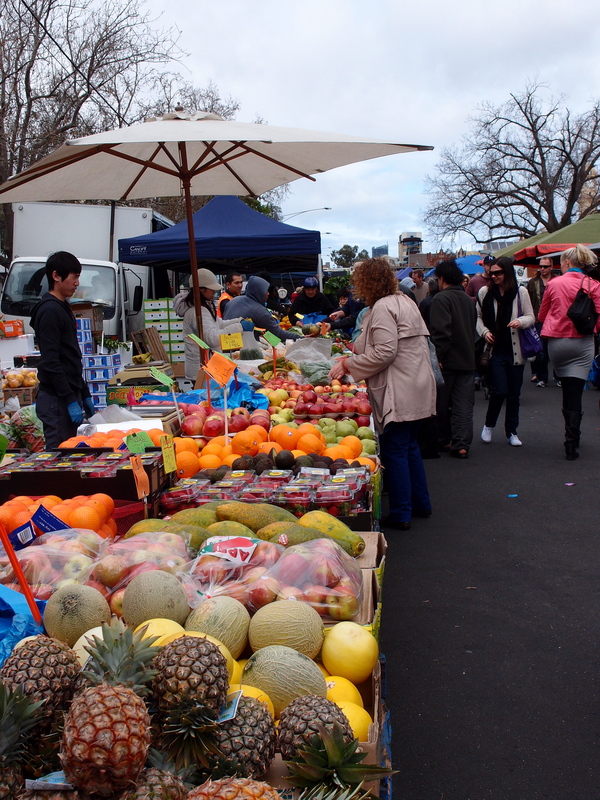 Since 1873 the market has offered fresh fruit, vegetables, bread, eggs, conserves, flowers, meat, pastries and entertainment and is open from 7am every Saturday (Christmas and Easter are exceptions). With a small turnover of stalls it is very easy to build a repour with your favourite stallholders, some of which have been involved with the market for over 10 years. With the smells of freshly cooked breads and wafting sausage sizzles and the sounds of regular musicians from the recorder man and the varying guitar ensembles the flavours and sounds of the market are memorable. 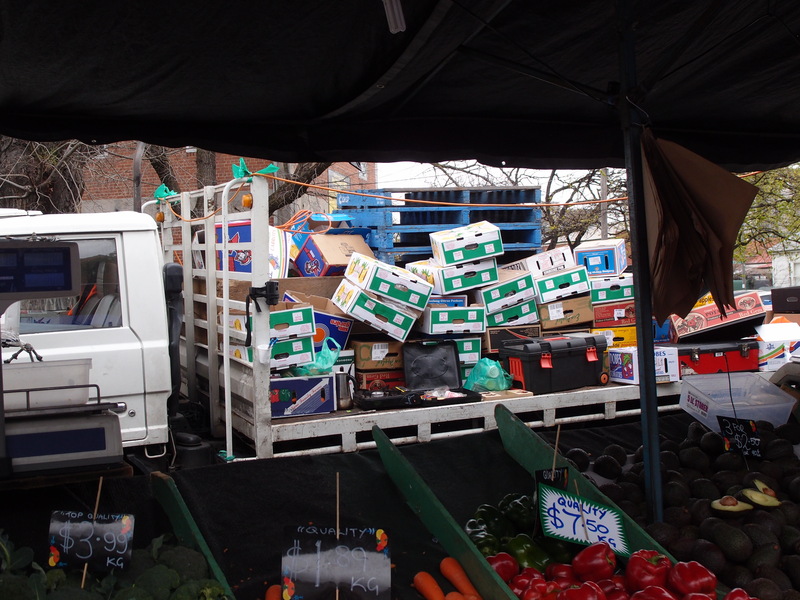 Throughout the morning, stallholders yell above one another competing for your business – $2 for five avocados here, $5 for a kilo of bananas there. There is no limit to how low some of the prices can go and although the freshest selection is available earlier in the morning, by the end of the day stallholders are practically giving away what remains. From time to time local councillors and electoral candidates will pay a visit with a pop up stand where locals can ask the all-important pressing questions the everyday woman might have and more often than not a Big Issue vendors drops in for a couple of hours too. With Leo Berry’s boxing gym and the Richmond Recreation Centre both situated on Gleadell Street, the market attracts many weary post gym devotees that strut their somewhat varying gym apparel and a variety of smells around the market. 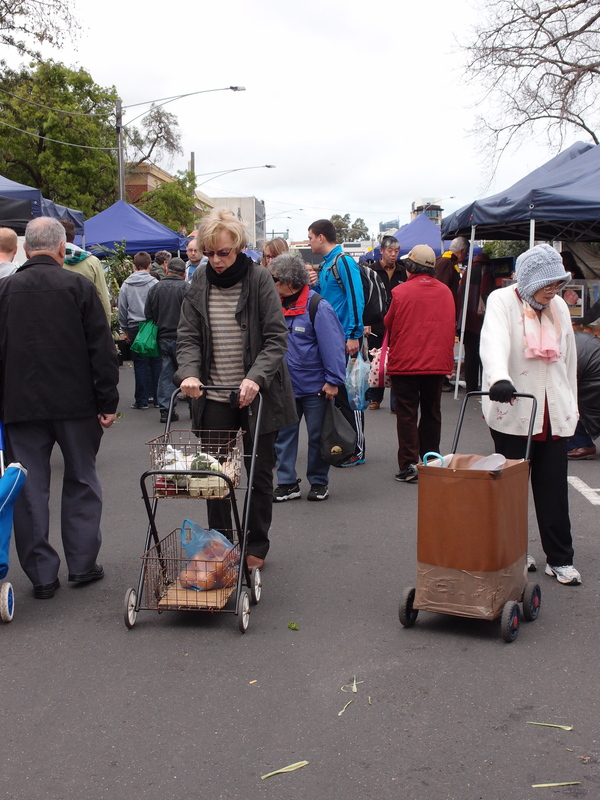 There is also a large community of elderly Greek and Italian visitors that have lived locally and shopped at the market for several decades that are the most dedicated and are usually the first to arrive rain, hail or shine. One thing I don’t like so much about the market are the number of dogs and children. Owners of both often fail to restrain their respective responsibilities and several go rogue throughout the morning, most often by the lure of the other. Children love dogs but unfortunately, many dogs don’t like children they don’t know and although I am yet to see a physical fight between dog owner and child owner – looks and words are often exchanged. Despite this, the often free-spirited clientele the market attracts swiftly forget their kafuffle and move on. All of the sudden, it is 1pm and the stalls are packing up, I am stuffed, as is my shopping trolley and as I watch the array of eclectic and fascinating people from all walks of life come together to achieve the same result and slowly disperse back to where they came from, I stuff my face with another punnet of strawberries, collect my bike from the pile at the end of the street and I have managed to overcome yet another not so lazy Saturday morning.